Recommended Microgaming Casinos or play the no signup free slots version in our Free MG Slots. 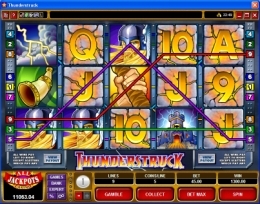 Thunderstruck brings the mythological Norse God Thor back to life in this high paying, 5 reel, 9 payline bonus slot game. The range of wagering in Thunderstruck has been clearly design to suit a variety of slots players. Conserve your bankroll betting as little as 9¢ per spin or high roll with a maximum bet of $45.00 per spin, or pick your own comfort level between the two. The reel symbols in Thunderstuck are colorful with animated graphics and great sound effects. Thor himself is the wild symbol and doubles your win when combined with all other reel symbols except the Ram scatter symbols. Just two Thors net a win of 10 coins while 3 wins 200 coins. Get 4 Thors and the win increases 5 times to 2000 coins. All 5 Thors awards a top prize of 10,000 coins for a 1 coin bet and 50,000 coins when betting maximum. Get them during a free spin betting max and the win is 150,000 coins! Thunderstuck slot has some other great paying reel symbols, the Hammer, the Fist, the Castle, the Lightning and the Horn. The Hammer symbol awards a three coin win for just 2 stopping on a covered payline while 2 Fist symbols award a three coin win. Get 3, 4 or 5 of either and the wins increase to 25, 100 and 750 respectively. The Castle, the Lightning and the Horn symbols award from 10 coins all the way up to 400 coins when 3 or more stop on a covered payline. The Thunderstuck slot game lower paying symbols Ace, King, Queen, Jack, Ten and Nine round out reel set and pay from 5 coins through 125 coins depending on the number that stop on a wagered payline. However,the big payout starts when 3 or Ram symbols stop anywhere on reels triggering the 15 free spin bonus round. Each payline win during the free spins pays 3x and if you get another 3 Ram symbols during a free spin you retrigger another 15 free spins. Thunderstuck slot also has a Gamble Bonus Round that you can optionally play at the end of any winning spin to further increase your bounty. You can even play the gamble bonus at the end of the free spin bouus round. In the Gamble Bonus Round you try to guess the color of the card or the suit of the card. Guess the correct color and you double your win. Guess the correct suit you quadruple your win.